To begin setting up WMC, open the Start menu and click on “Windows Media Center” (it will have a green round icon with the Windows logo). This will open the welcome screen for WMC. For now use your mouse to complete the set up process. 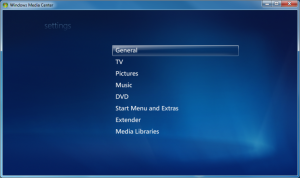 Once WMC is configured, you’ll be able to use your remote to access all of the features available. Click on the Continue button to go to the installation screen. Choose the Custom option to begin the set up process. This will take you to a screen that shows the basic steps in the initial configuration process. Click the Next button to continue. 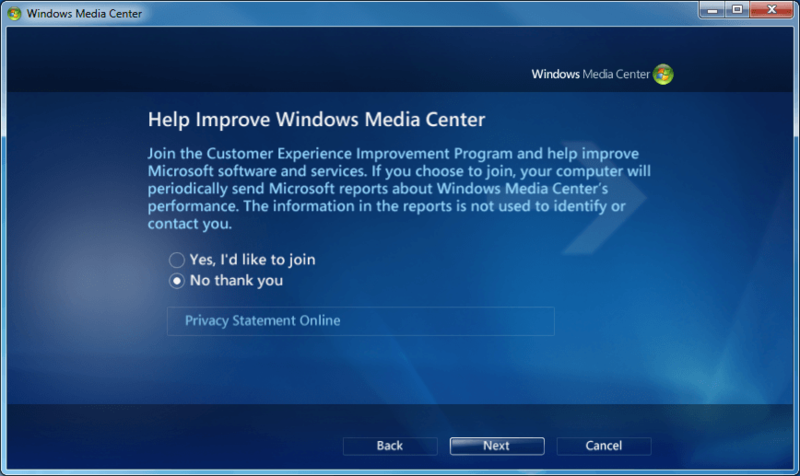 The next screen will ask if you want to participate in the Customer Experience Improvement Program. You can choose yes or no based on your preference. Click the Next button to continue. 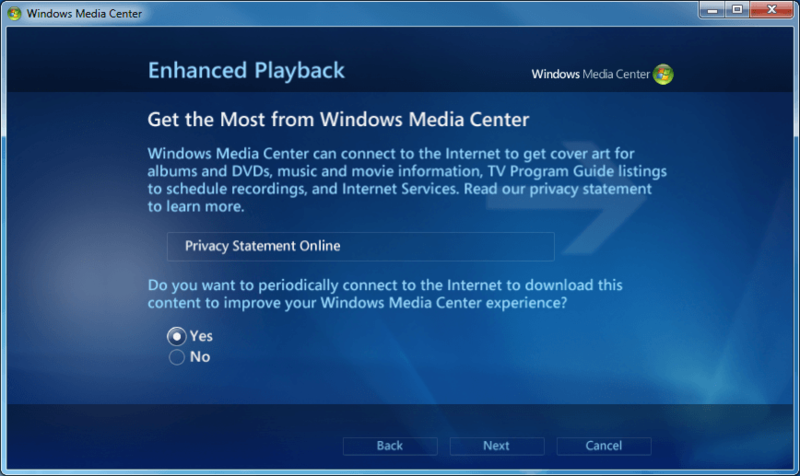 The next screen will ask you if you want to download metadata for your content to enhance playback. 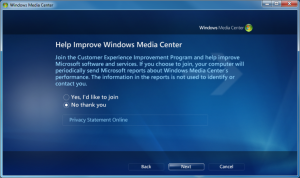 I recommend choosing “Yes” for this option as it will greatly enhance your experience. When you use WMC to listen to music or watch a DVD, WMC will automatically download cover art and other information about your media. This really enhances the “wow factor” of WMC. Once you make your selection, click the Next button to continue. The next screen allows you to set up your display, speakers, and media libraries. You’ll want to set up each of these options to optimize your WMC experience. 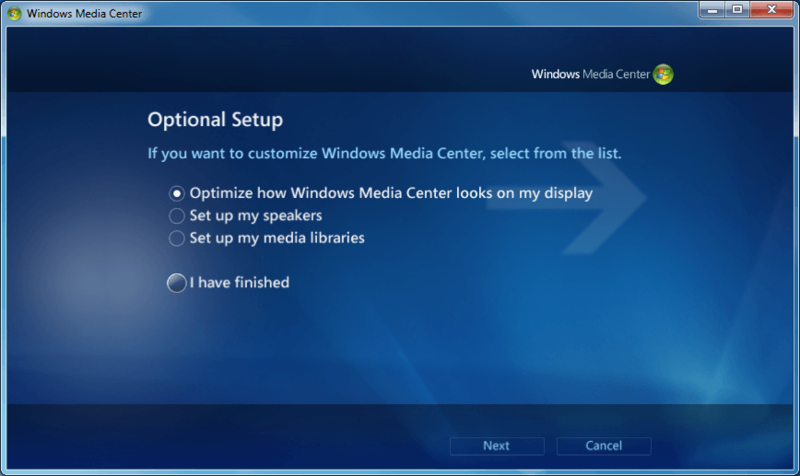 First, select “Optimize how Windows Media Center looks on my display” and click the Next button to continue. 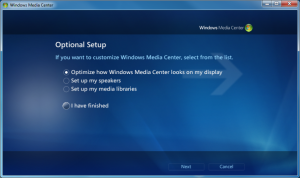 The display set up process will ask you to determine if you have a widescreen display. 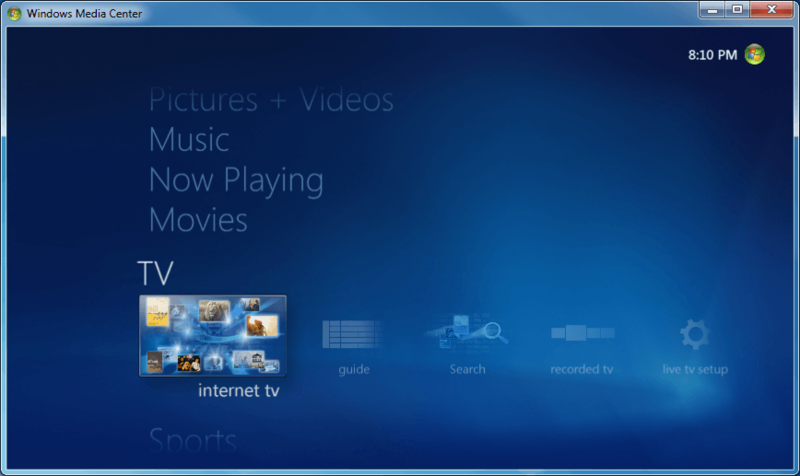 If you have your HTPC hooked up to a high definition TV you’ll want to choose widescreen. 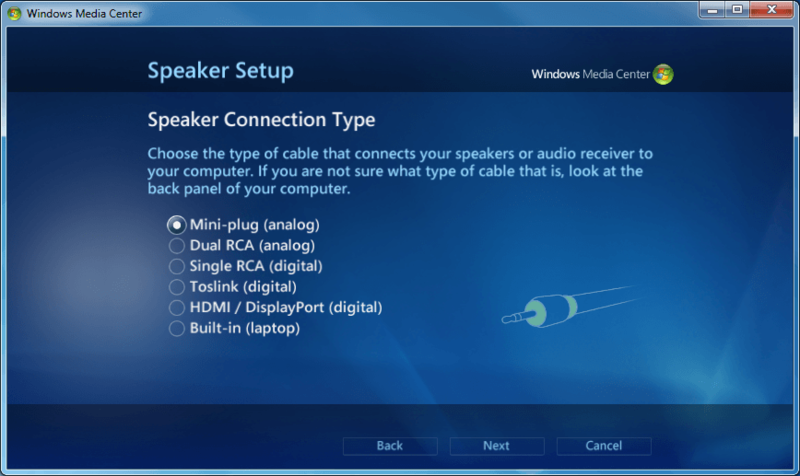 Once you complete the display set up, choose the “Set up my speakers” option and again click the Next button to continue. 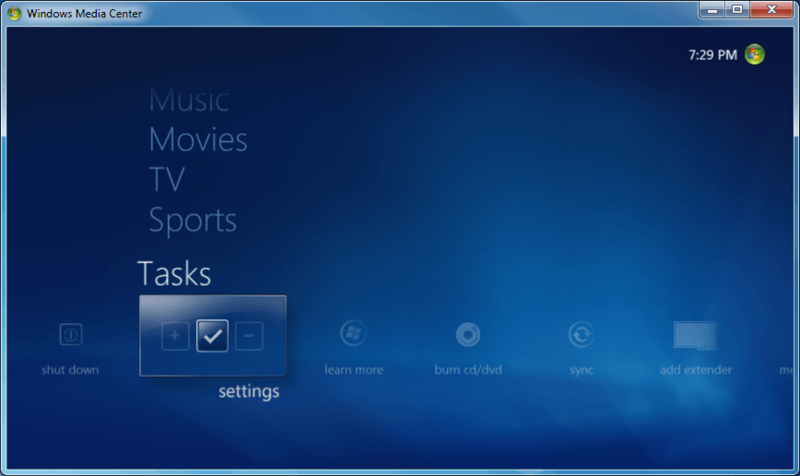 The next screen will ask how your speaker are connected to your HTPC. This depends on your home theater equipment, so be sure to select the proper connection (the images on the right side of the screen will show you what each connection looks like if you are unsure) and click the Next button to continue. On the next screen, choose the number of speakers you have. 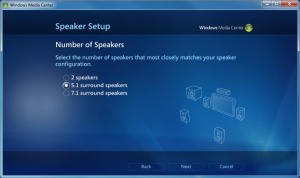 You can choose 2 speakers (stereo), 5.1 surround, or 7.1 surround. Then click the Next button to continue. On the next screen, WMC will perform a test to determine if your speakers are working properly with your HTPC. Be sure your speakers are connected and everything is turned on. Click the Test button to perform the test. 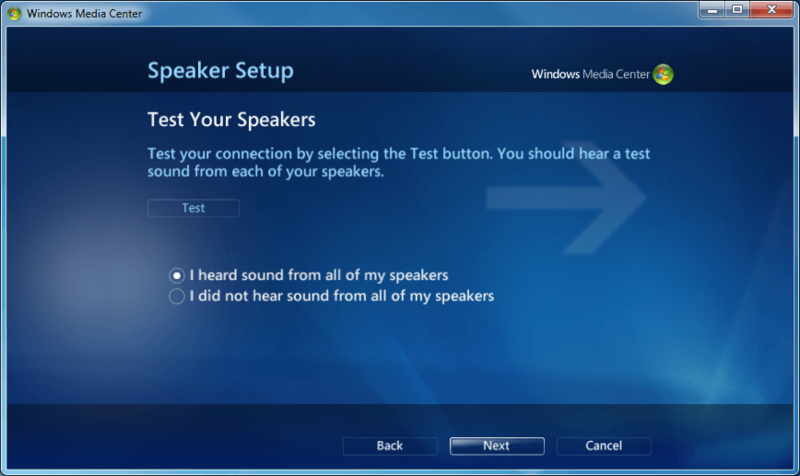 If everything worked, select “I heard sound from all of my speakers” and click the Next button. If the test did not work, select the other option. 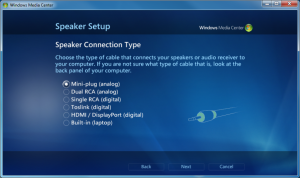 You’ll need to troubleshoot the problem and then set up your speakers again. Once your speakers are set up, you’ll need to set up your media libraries. This tells WMC where to look for your music, photos, and videos. Select the “Set up my media libraries” option and click the Next button to continue. 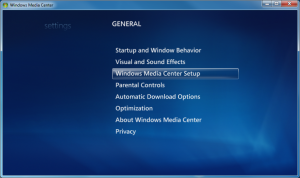 If you have all of your media in the default location for Windows 7 (e.g. in your My Music, My Pictures, and My Videos folders within your Users folder), WMC will look in those location by default. 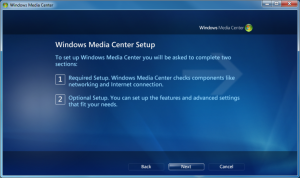 If you have media on a separate hard drive, an external drive, or a network drive, you’ll need to add those locations. 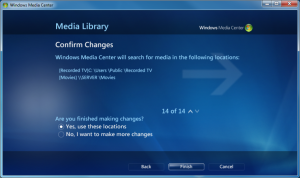 Once you’ve added the necessary folders to each library, WMC will ask you to confirm if you are finished making changes. Choose “Yes, use these locations” once you are done and click the Finish button. 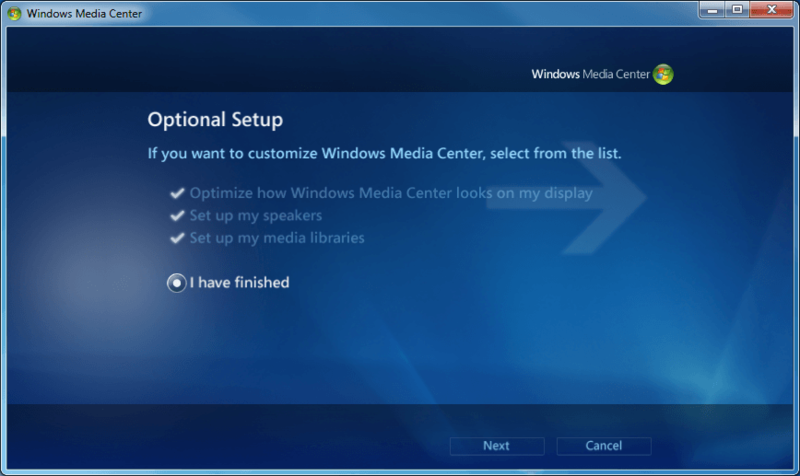 Now that you have completed the optional setup for WMC, choose “I have finished” and click the Next button to continue. 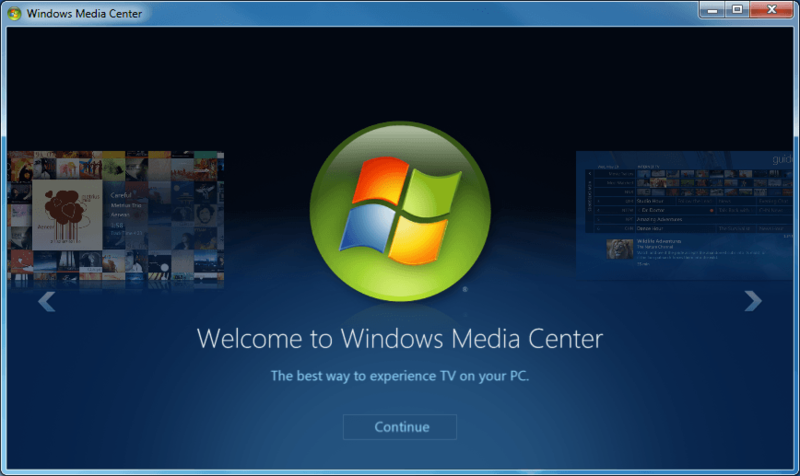 WMC is now configured and you can start using it to view your media. 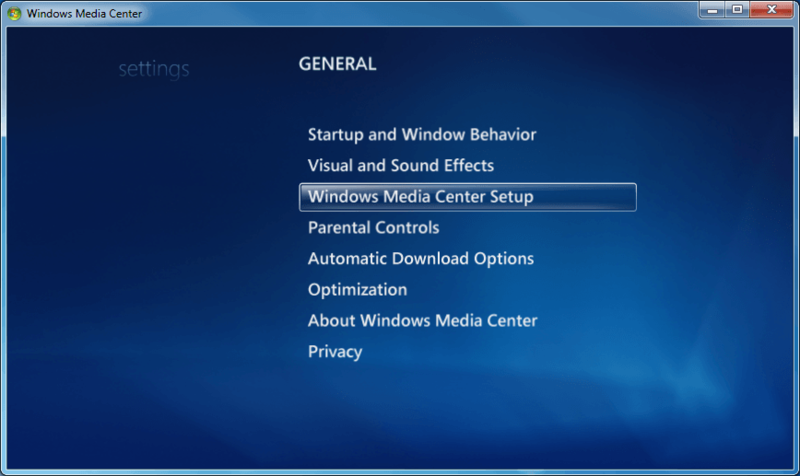 Several additional settings should be configured to optimize your WMC installation and access additional features beyond merely viewing your own media. 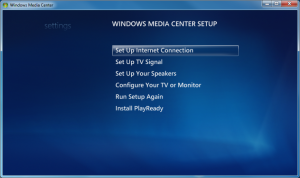 One the settings screen, go to General > Windows Media Center Setup > Internet Connection to choose your internet connection type and test the connection. Once your internet connection is tested and working, go back to the Windows Media Center Setup screen and choose the “Install PlayReady” item on the screen. 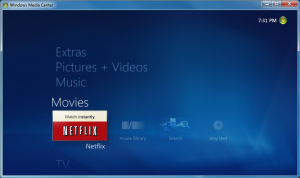 This will allow you to use WMC to view protected content like Netflix streams. 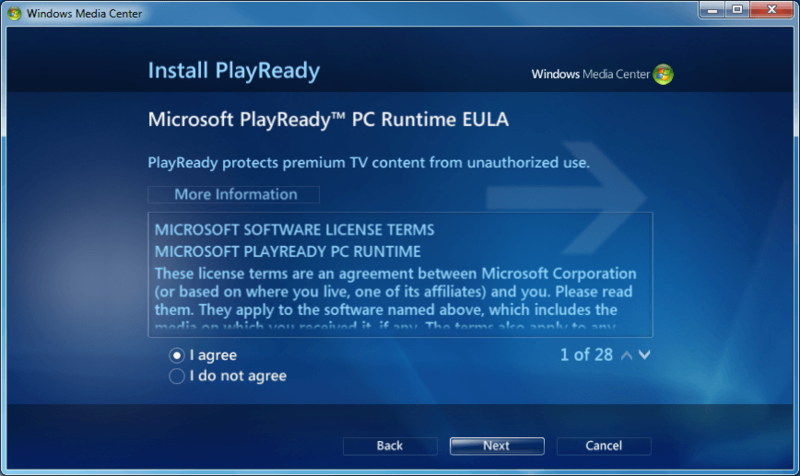 On the Install PlayReady screen, you’ll need to agree to the terms of the EULA before continuing. Choose “I agree” and click the Next button to continue. 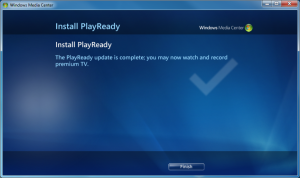 Once PlayReady is installed, you will see a confirmation screen. Click the Finish button to continue. 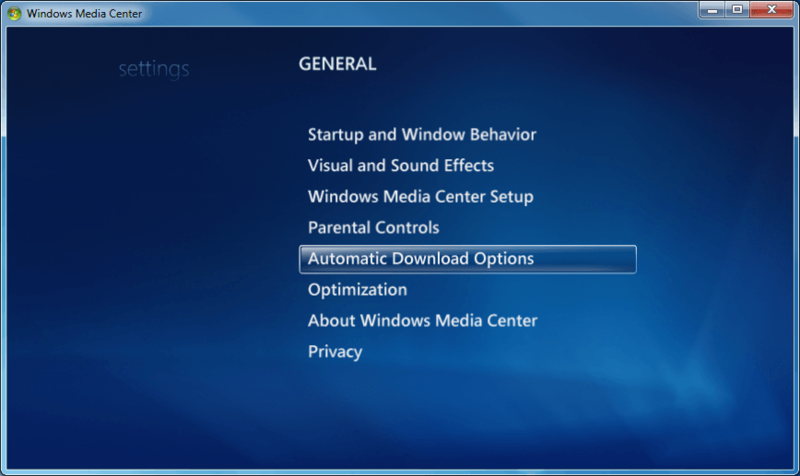 Go back to the General settings page > Automatic Download Options. 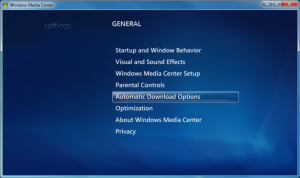 On this screen, select both check boxes and click the Download Now button. Then click the Save button to save your settings. 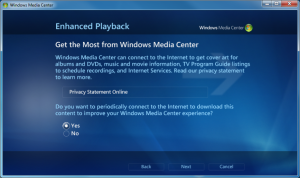 WMC will begin downloading information about your media and any program updates that it may need. This could take a while depending on your internet connection speed and the amount of media you have. 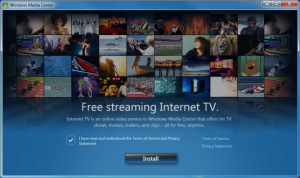 WMC allows you to stream free TV shows and clips from the Internet. 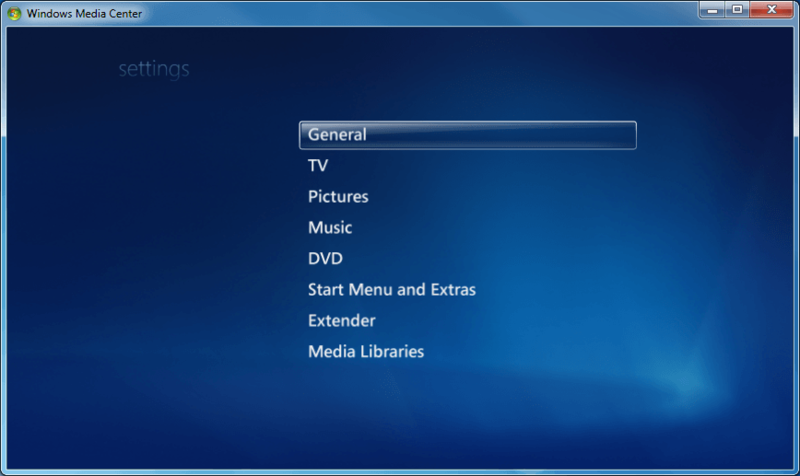 The selection of content is somewhat limited compared to what Boxee or Hulu provide, but the most recent episodes from many popular TV shows are available along with episodes from older shows as well. 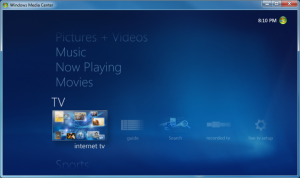 To set up Internet TV, go to the main screen and navigate to TV > Internet TV. You’ll need to agree to the ToS and Privacy Statement before installing Internet TV. Click the Install button to continue. Once Internet TV is installed, you may need to install the Adobe Flash Player before you can view a streaming TV show. 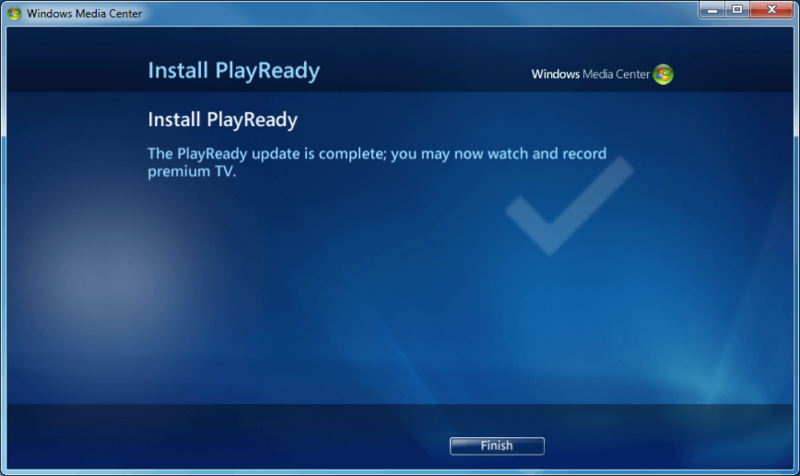 If you don’t have the player, you’ll see the Internet TV Update Screen. 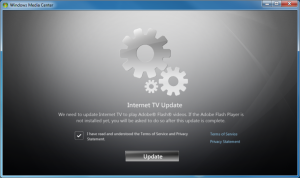 Agree to the ToS and Privacy Statement and click the Install button to install the Adobe Flash Player. Your Internet TV should now be ready to view free streaming TV shows and clips. WMC also supports Netflix Instant Watch streams. Thousands of movies and TV shows are available to watch with your Netflix subscription, and some of these are even available in HD (the HD streaming selection is limited right now, although more HD streams are available on other Netflix-enabled devices). To install Netflix, go to Movies > Netflix. 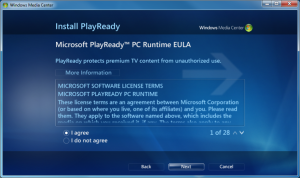 You must agree to the ToS and Privacy Statement, then click the Install button to continue. 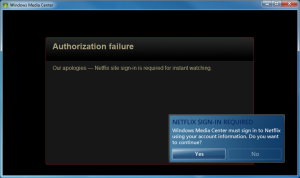 Once Netflix is installed, you’ll need to supply your Netflix login information so WMC can access your Netflix account. 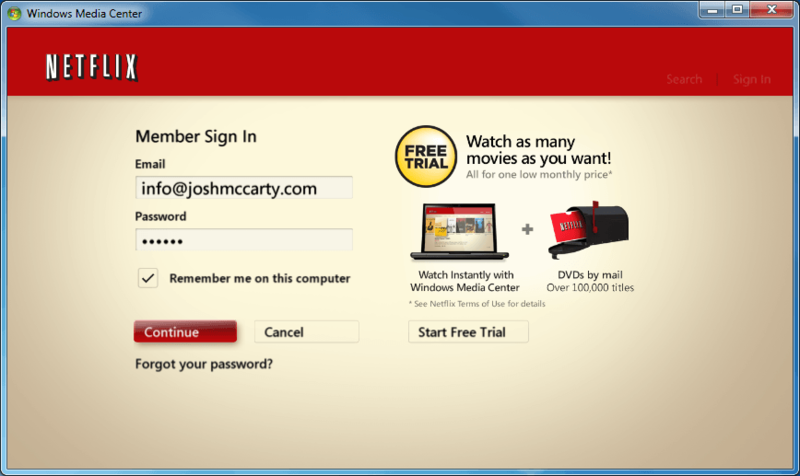 Enter your login information, select the “Remember me on this computer” check box, and click the Continue button. 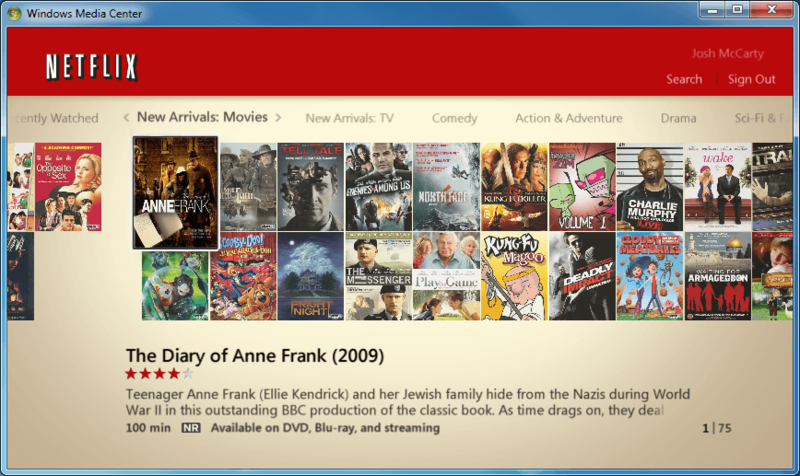 Test your Netflix streaming by browsing to a movie and playing it. 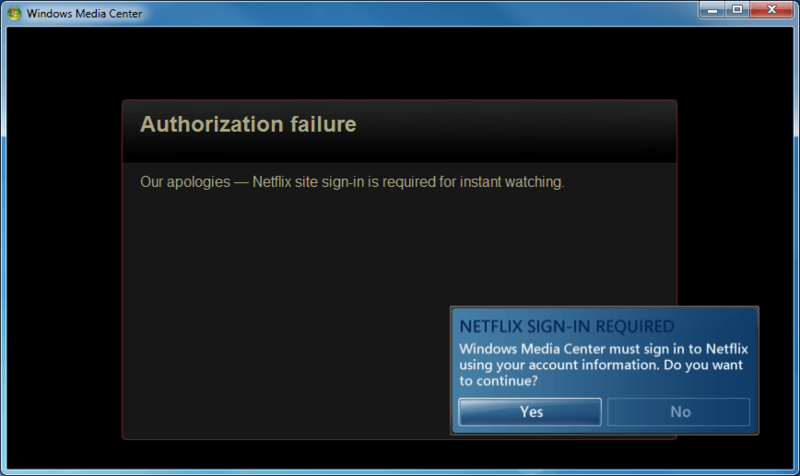 The first time you play a movie through Netflix you will see an Authorization failure screen. Simply click the Yes button to complete the authorization and view the movie. To view streams in high definition, look for an “HD” icon below the description of the movie (it will be next to the rating information). Netflix should now be set up for WMC. As long as you continue to subscribe to Netflix, you will have access to all Instant Watch content on Netflix. 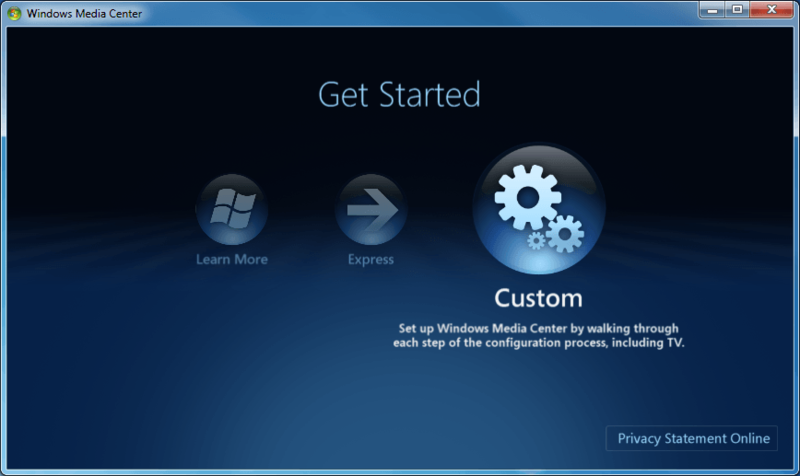 There are several third-party plugins available for WMC that add additional functionality or enhancements. 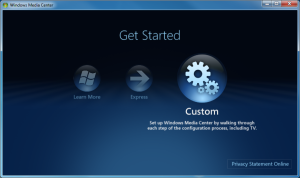 In my next post I’ll cover how to install and configure some of the more popular third party plugins. Stay tuned!